(9 a.m. EDT) -- Today, Oceania Cruises announced a major investment in modernizing its fleet. The company unveiled a multiyear project called OceaniaNEXT, which will ultimately touch all aspects of the line's upscale cruise experience -- its ships, emphasis on cuisine and fine dining, and destination focus. 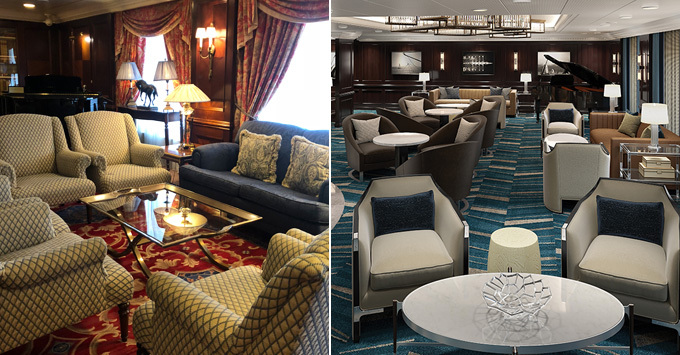 The first step is a $100-million refurbishment of its four oldest and smallest ships -- the Regatta Class -- which will lead to brand-new cabins and reimagined public areas. The cruise line has sought input from its past passengers and travel partners to develop these plans to enhance its onboard product, programs and service. Future phases of OceaniaNEXT will touch on its dining program -- in 2018 alone, Oceania has introduced new lunch and dinner menus with a global flair, as well as new culinary classes -- and destination focus -- including new ports and enriching in-port experiences. Oceania's 684-passenger Insignia will be the first ship to go under the knife, emerging with its new look December 7, 2018. Its nearly identical R-class sisters will get their makeovers over the next two years: Sirena in May 2019, Regatta in September 2019 and Nautica in June 2020. The cruise line has hired Miami-based Studio DADO to reimagine the four ships. 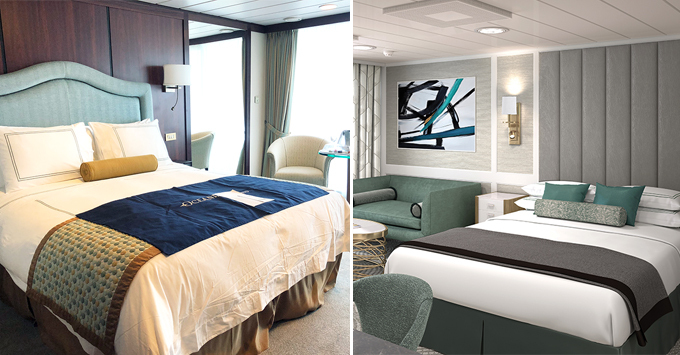 The design and concept studio, which focuses on high-end residential and hospitality projects, has chosen a modern and airy look for the ship to maintain the atmosphere that loyal passengers enjoy, while updating the decor. Interior design companies Baker and Donghia have been tapped to provide furnishings, with textile designers Rubelli and Kravet dressing public areas in their fabrics. 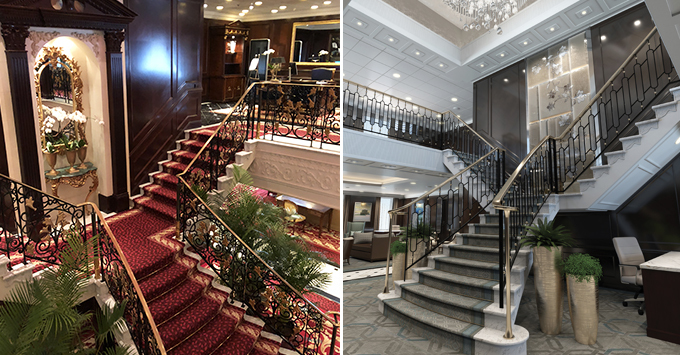 The ship's new look will be the most dramatic in the staterooms and suites, which will be stripped to their studs and redone from scratch. The dark woods, brown hues and wave-inspired couches and headboards will be replaced with a lighter, brighter and cleaner look. Rooms will take inspiration from sea and sky with silvery grays and greens with sapphire and taupe accents. The intended effect is to make cabins feel more spacious. The line is promising "custom-crafted furnishings, exotic stone and polished wood finishes, and designer accessories," according to its news release. Modern technology will also be incorporated into the redesign, with USB ports and a state-of-the-art interactive TV system (including movies on demand and weather forecasts for your trip). Bathrooms will also be overhauled with new designer fixtures and lighting, glass shower enclosures and modernized vanities. The more spacious bathrooms in the Penthouse, Vista, and Owner's Suites will be redone in luxury style with Carrara marble, polished granite and onyx. 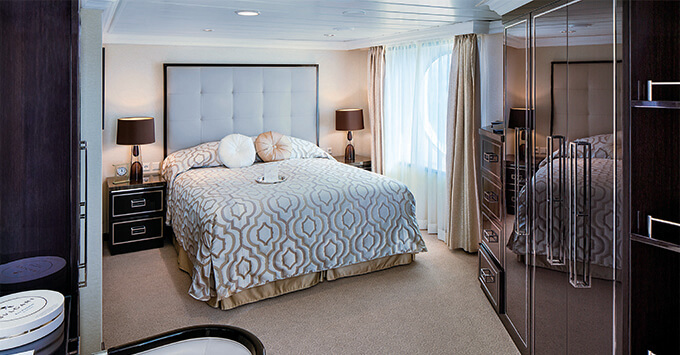 The ships' accommodations won't be the only areas with a new look. The Grand Dining Room will wow with an eye-catching crystal chandelier at its center, as passengers sink into buttery soft leather dining chairs done in cream with metallic bronze threading. The ceiling frescoes there and in the Grand Bar will be no more. The main bar area, Martinis, will ditch its country-house look, red accents and elaborate fabric designs for a venue that evokes Santorini with a palette of Grecian blue, sienna and chocolate browns and pewter. Patterns are simpler and furniture more angular. The walnut-colored wall paneling will stay -- for those feeling a bit overwhelmed by all the changes. The Reception Hall and Upper Hall will also be reimagined, most notably along the Grand Staircase, which will sparkle with highly designed railings and balustrades inset with crystal and overlooked by a chandelier, accentuated with smoked and hand-painted glass. Other changes include opening up Horizons to make it brighter with unobstructed 270-degree views and new furnishings in specialty restaurants Toscana and Polo. The Library will be refreshed by keep some of its original decorative elements.